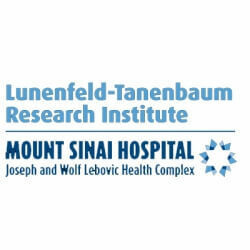 The Lunenfeld-Tanenbaum Research Institute of Mount Sinai Hospital, Toronto, Ontario, Canada was established under the name of the Samuel Lunenfeld Research Institute in 1985 by an endowment from the Lunenfeld and Kunin families. On June 24, 2013 Larry and Judy Tanenbaum have made a transformative $35 million gift in support of research at the Mount Sinai Hospital. In recognition of the gift, the Institute was renamed the Lunenfeld-Tanenbaum Research Institute. It comprises 36 principal investigators, has a budget of C$90 million (2005/6), has over 200 trainees and approximately 600 staff. The Institute conducts research into various forms of cancer (colon, breast, pancreatic, prostate), neurological disorders and brain illnesses, |women's and infants' health, diabetes, developmental biology, stem cell biology and tissue regeneration, mouse models of human disease, genomic medicine and systems biology. The Institute has 100,000 sq ft (9,300 m2) of space and is split between the main hospital and the Joseph and Wolf Lebovic Health Complex. The founding director was Dr. Louis Siminovitch (1984â€“1994), followed by Dr. Alan Bernstein (1995â€“2000), Drs. Janet Rossant and Anthony Pawson (2001â€“2002), Dr. Anthony Pawson (2002â€“2005) and Dr. James Woodgett (2005-). Researchers are supported by the Mount Sinai Hospital Foundation, donors and external funding sources including the Canadian Institutes of Health Research, Canadian Cancer Society, Terry Fox Foundation, National Institutes of Health and Genome Canada.